Triathlon legend Sally Edwards has published a newly updated edition of the best-selling women's triathlon training book, Triathlons for Women. For over 20 years, Sally Edwards has cheered, prodded, and even pushed hundreds of thousands of women across the finish line of their first triathlon. This newest edition of Triathlons for Women can help any woman rise to the challenge of beginning a healthier, more active lifestyle. Women make up the fastest-growing demographic in endurance sports, especially in the red-hot sport of triathlon. 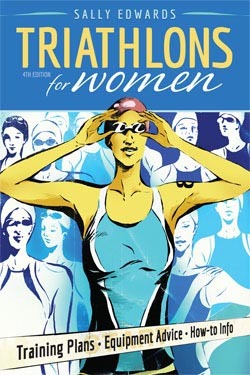 According to USA Triathlon, women now comprise nearly 40% of participants in the sport. Sally Edwards's inspiring career and tireless work have been major forces bringing women into triathlon. "Sally Edwards is women's triathlon! ", says Maggie Sullivan, director of the two largest women's triathlon series. In Triathlons for Women, Sally shares her experiences to prepare women physically and mentally for their first triathlon. Sally guides women from the first day of training to race day, with plenty of personal encouragement along the way. Triathlons for Women leaves no question unanswered, from workouts to the transition zone to the most common question of all-what to wear. Sally Edwards has seen hundreds of thousands of women launch a happier, healthier life by finishing their first triathlon. Triathlons for Women will help women realize their goals, whether they include getting fit, getting fast, or taking on a longer race. Paperback with 2-color interior. Charts, tables and illustrations throughout. Sally Edwards is a celebrated figure in the sport of triathlon. She was one of the first women to race the Ironman® and finished 16 Ironman races. She held the Ironman world masters record, helped to found USA Triathlon, and was inducted into the Triathlon Hall of Fame. Sally holds two MBAs, has written over 20 books, and founded the internationally franchised Heart Zones® fitness coaching company. Sally was for 20 years the spokesperson and final finisher of the Danskin Women's Triathlon Series and is now the Chief Inspiration Officer of the Trek Women Triathlon Series. For more information, please visit www.TheSallyEdwardsCompany.com. VeloPress is an endurance sports and fitness publisher with books on cycling, triathlon, running, swimming, nutrition and diet, yoga, and the histories and personalities of our sports. VeloPress authors are highly qualified, trusted experts. Our training books help both serious athletes and beginners to build skills and fitness while our human interest books inspire greater appreciation of our sports. For more information, please visit www.VeloPress.com.